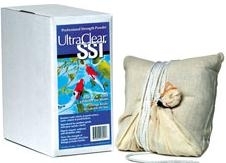 UltraClear DRY Super Strength Treatment (S.S.T.) for LARGE problem ponds with string algae. Restores water purity and clarity at the pond surface and at the bottom of the pond. Digests sediments and elinimates odors. Safe for fish and wildlife. Contains one 22oz dry powder flow-through bag that treats up to 10,000 gallons per month. Also available in liquid at a rate of one oz per 150 gallons.